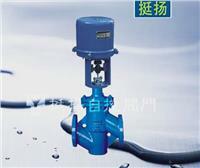 DZDLP electronic type electric single-seat control valve is 381L Series electronic actuator and low flow resistance through single-seat valve. The actuator uses an integrated electronic controller module, no need to reprovision the servo amplifier and the output force; body is covered through bottomless oriented “S” flow channel, as the plunger-type valve body with a smooth flow , flow coefficient and so on. The product has a reliability, flow characteristics and high precision, adjustable ratio, compact structure, small size, etc., can be widely used in petrochemical, pharmaceutical, metallurgy, paper making, water treatment and other industries, control a variety of different fluids the media.